8 posts categorized "Huffington Post"
"Election T-Shirts Build A Community of Supporters"
To read my other Huff Post/OTB pieces, click here. My new post "Insuring Voting Works, One Tweet at a Time: Interview with Allison Fine, Co-Creator" is now live on The Huffington Post's OffTheBus. The all-volunteer group Twitter Vote Report will be monitoring tweets from now through November 4th and beyond to look for those which report voting problems. When TVR finds them, they figure out which of their vast coalition of election protection groups can help fix them. With record turnout predicted during this historic presidential election in the United States, many believe there will be problems and system overwhelm as droves turn out on election day. Indeed, Twitter Vote Report has already found problems in early voting states and have worked to get them corrected. TVR is an example of how social media, technology and an energized constituency can contribute to making a democracy function at its best. If you're a U.S. citizen who can vote, read to learn about how Twitter Vote Report can help make sure your vote counts. If you are a U.S.-presidential-election spectator from outside America, check to see one way citizens here are participating to make the democratic process work. UPDATE: This piece was featured in The Huffington Post's "Voting Problems" section. Its tagline: "Some news is so big, it needs its own page." If you are interested in election protection and voter disenfranchisement, this page is your link to current happenings in this area, so do check it out. This U.S. presidential election season continues to draw massive interest from both the American voting public and others around the world. One of the most fascinating aspects to me, as a writer focusing on media and tech, is how Web innovations and platforms are increasing political expression and participation. Social media platform Twitter has blended with user-driven cable network Current TV to offer a venue for tech-connected youth (primarily 18-34) to be involved during the three presidential and one vice presidential debates; it's called "Hack the Debate". My post about this, "New Media Forms Boost Youth Participation in Debates", is now live on The Huffington Post's ground-level election coverage, OffTheBus. If you'd like to read about this innovative media experiment, get a preview of how technology will change media for future elections, and perhaps even participate, click here. 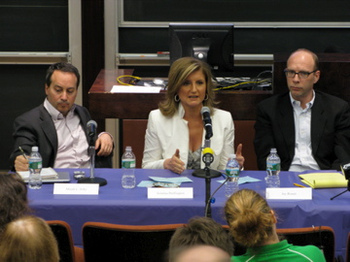 Last Friday evening, I went to a panel discussion on "How the Web is Changing American Politics" at New York University. The panelists were Arianna Huffington of The Huffington Post, Micah Sifry of techPresident.com, Jay Rosen of NewAssignment.net, OffTheBus and NYU, and Lisa Tozzi of The New York Times' Caucus Blog. Jeff Jarvis of CUNY and author of the blog BuzzMachine moderated the panel. 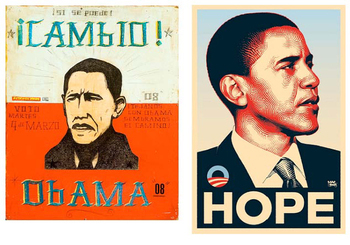 The Web has dramatically affected the 2008 U.S. presidential elections. In fact, if it weren't for the Internet, Hillary Clinton would probably be the unquestioned Democratic nominee for President, said Micah Sifry. He described the deep network of grassroots supporters that Barack Obama's campaign has built by using the Internet. Because of blogging, the established media is becoming more democratic and more stories are being told. Sifry said that Obama is making fantastic use of technology and online communities. Arianna Huffington described how Obama's campaign used Facebook to get out votes for the Ohio primary. By looking through all Obama "friends" on Facebook, his campaign picked out those in Ohio networks and then, by going door to door, encouraged them to vote. She's also starting an organization called "Partnership for a Poll-Free America" because she feels polls are so misleading in elections. Huffington also believes strongly that there is a truth in politics that is often not reported by mainstream media, and that blogging helps get that truth told. Jay Rosen told how the Obama campaign hired Chris Hughes, co-founder of Facebook, to use community organizing to mobilize voters for Obama, and it's working. It's all about how to organize people, Rosen said, and because of this ground-level work, the elite cannot predict how the voters will vote this time. The race has too many transparency wildcards in it now. If Obama wins, he has a Web strategy in place to use technology in his presidency to implement his policies and make them work. Lisa Tozzi explained how things work at the Caucus Blog, where reporters not only write full-length features but also regularly write short, quick blog posts (very unlike the traditional-print-newspaper process). News moves at light speed in the Internet age, and Caucus writers have adapted to get the accurate word out as soon as they can after it happens. Traditional media has been broken wide open and become democratized because of blogging, citizen journalism outlets, and YouTube. The power is moving from the elite to the people because of it. Look for more campaigns to be run using the Web in more sophisticated ways in the future. (But will we see fewer political commercials on TV from now through November? Stay tuned.) Though much already has been created using the Web, much more can and will be made — 2008 is just the first, truly Web-oriented presidential election. Now that politicians have experienced the Web's power, watch out for how they will use it in future national, state and local elections. There was a lot more to this panel discussion than the few points I've described above (including how protesters in Tibet and China used Twitter to share news about political crackdowns there). This is a hot topic which affects many. If you're interested in seeing video of the event, citizen journalism site GroundReport is hosting the complete telecast.